Wee Play is a wonderful fabric showcasing children enjoying the outdoors playing in wagons, playing baseball, going up and down on a teeter totter, roller skating and all of the fun activities our kiddos love to do. Such wonderful expressions on these children's faces and the bright primary colors in shades of red, blue, yellow, green, gold and brown. 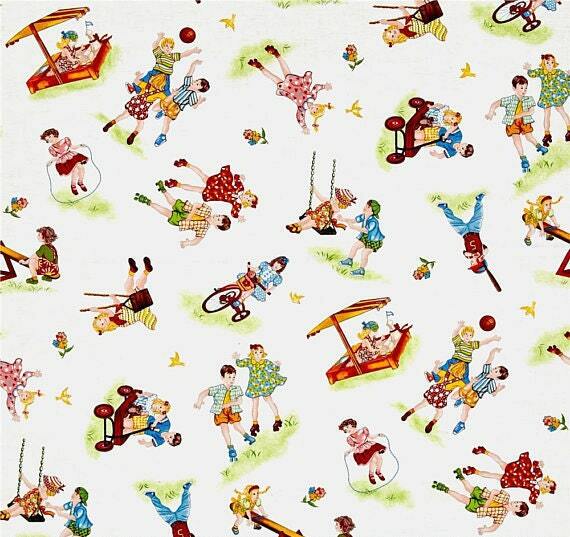 Such a beautiful fabric to create something special for your special kiddo! All fabric from The Quilted Nursery Children's Fabric Store is cut directly from the bolt in continuous yardage. We now offer fractional yardage cuts for your shopping convenience. All shipping overages are refunded upon shipment of fabric. Same day shipping except for Sunday and holidays! Repeat buyer! Who can resist this shops unique fabrics, and amazing prices? Definitely not I! Thanks for everything, just wish I could have reused the really cute shipping bag! Loved the card, too!! Such cute fabric at a great price!